Birth day Cards Designing Software is incorporated with advanced image designing objects like Line, Ellipse, Pencil, Rectangle, Text, Picture, Arc, Triangle and Star etc to create wonderfully birthday cards. You can easily add photos, text, personal messages, to design the card according to your wish. Enables user to design new birthday card or edit existing card. 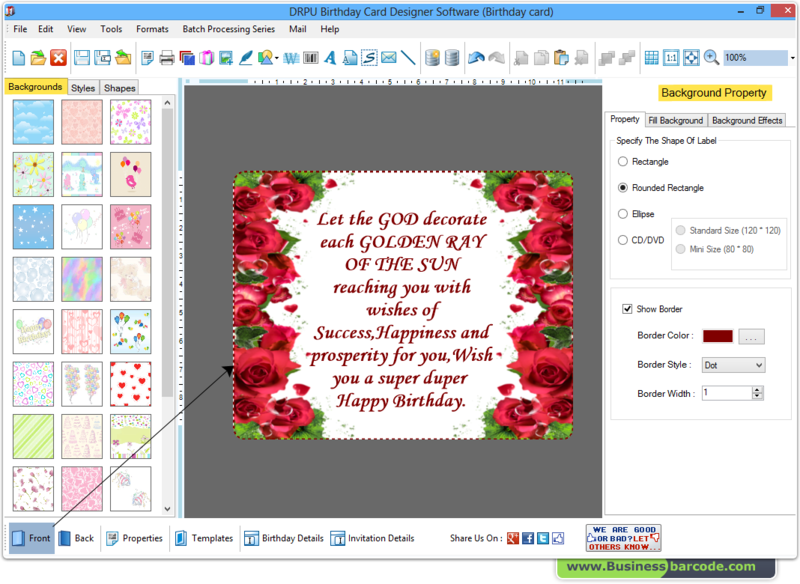 DRPU Birthday card maker software design birthday cards for your loved ones. Provides inbuilt data set series features to design multiple birthday cards. Make Label and create card with image designing objects including Line, Ellipse, Pencil, Picture, Arc, Triangle and Star objects. Provides facility to save created birthday cards at any location on the computer system for future usage.